Tell a little about yourself, Michael. You came to America when you were extremely young. Why did you decide to become an actor and study dramatics? And why in USA? What was the reason you chose such an interesting profession? Was it hard to win through? First of all I'd like to start by saying that I've always been a very shy kid, and to this day remain so. When I was 17, my father and I came to Los Angeles in search of a better life. But because the rest of my family was in Russia, he had to go back and I wound up staying in LA by myself. Of course the first challenge was the language. I had to spend at least a year before I started speaking at a basic level. Second challenge was that I didn't know what I wanted to do with my life. But because of my musical education (Gnesinikh University (1) and Conservatory), I was in a rock band for the first seven years here. I was always interested in show business. I remember when I was a kid, my father took me to the Mosfilm studios (2) and I was amazed by the sets and how easily you can end up in a different century or in an imaginary world. That thought was deeply embedded in me and was the reason why I wanted to become all the characters at once. Living in Los Angeles, I understood that I am in the right place and the right time to make that dream a reality. Of course, the main problem with this industry, is that nobody knows anything 100%. My knowledge of the industry was also minimal. I had a great desire, but had no idea where to start. Somebody suggested to try working as a background actor. While working as a background actor, little-by-little I was finding out crumbs of reliable (and not so much reliable) information about the industry. As time passed somehow I was called for an audition for MTV's reality show "NEXT". Even though I am not a big fan of reality TV, I ended up getting it. Then I was called to audition for the "American Inventor" commercial and booked it as well. Later I even got a commercial for MTS. Slowly but surely I was progressing in my understanding of the industry and growing as an actor. After that I started taking acting classes and found an agent. I also started taking classes to learn about work behind the camera, from which I had my own satisfaction. As time passed I got experience in directing, producing, and script writing. To answer the question if my path on stage had hardships - I will say that my path is far from being finished and hardships come hand-in-hand in this business. But if you have love for art, you see those hardships as necessary motivation! There is a very interesting mention of your genealogy on your page on imdb.com. Could you please tell us some more about it? In regards to my ancestry it is also a very long and interesting story, and if you want to read about my father you can go to: internationalroyalcourt.org . Will only say that for me, "roots" are not about how you present yourself, but rather a set of good disciplines and qualities. Were you a videogame voice actor before or working with Telltale Games was your first experience in this area? The voiceover industry is quite large and I am lucky to be a part of it. Before TellTale I had roles in projects like Steel Battalion game, Jameson Whiskey ad, and a number of other commercials and ADR's (3). Arvo at this moment is my biggest and the most interesting voiceover character so far. Have you been familiar with TWD game before working for that company? Did you know about The Walking Dead universe? 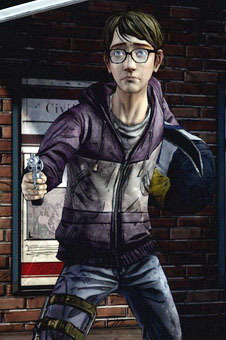 Before working with TellTale I had a chance to play in the first episode of The Walking Dead Game. I remember that I was astonished of how different from the rest of the cellphone games it was and how it made me feel very involved in lives of those characters. Post-apocalyptic worlds are truly one of my favorites, and if you add walkers to it, it becomes a full set! I enjoy this genre very much and watch shows like TWD with pleasure! To be honest I never imagined that I would be a part of this world as well, and for that I am truly thankful to Telltale Games. How did Telltale Games invite you to voice Arvo? Like everything happens in Hollywood, my path with TWD happened accidentally! I'm part of a Russian actors in LA group and we often encourage each other, share our success stories, and also post different casting notices. One of those casting notices was posted about a voiceover in San Francisco (around 6 hours away from LA). Because it was so far away, it didn't sound too appealing. Nevertheless, because I love this industry and preferred to be a working actor, I responded anyway. When casting sent me a request to record a voice demo along with the name of the project, character and a couple of scenes, I understood that it was an opportunity to get involved not only in a big, but also a very interesting project! As a big surprise, after a month or so, I got an email that said I booked the role. Of course I got very excited! How did the recording happen? Did you record in the company’s office in San Rafael or in a special studio? Did you have to leave Los Angeles for this job? My second surprise was when TellTale gave me a recording studio in LA and I didn't have to drive back-and-forth to San Francisco. Because of this, I had to record by myself, only with the director over Skype. I never had a chance to meet face-to-face with other voice participants, and had to work with the recorded pieces of their dialogue. Is there a difference for you between acting on a set and dubbing yourself later in a studio from working with the computer characters, which will have your voice? Every area of this business is truly unique and demands a certain way of doing it. Voiceover is definitely different from movie, TV, or theater acting. Even voiceover itself has many different subdivisions on its own. When working on Arvo I had to create a character who is younger than me and who also lives in totally different circumstances. When you are working only with your voice, you are limited in how you portray your character. All of the attention falls exclusively on how it sounds. I don't know about the experience of other actors, but when you're recording in the studio and are surrounded by four walls with soundproof material, the only way to get into the right state of mind for me was to actually physically act the scene out like I would do it on a set. Do you keep in touch with anyone of the actors who voiced other characters in this game outside of work? Do you know who voiced Buricko and Natasha? At the moment, the only way for me to get in touch with other TWD actors is via Twitter, but I'm sure there will be a plenty of opportunities to meet them face-to-face. The world of show business actually is a fairly small place. Unfortunately, I don't know anything about the rest of the Russian characters, and even at the end of the role, sadly, I couldn't find their credit. Commonly, in human consciousness character and actor who voices him merge into a single person. How often do you get angry comments from the fans of the game who believe that Arvo is a negative character? Yes, it is absolutely right, that a character and it's voice become one. In case with Arvo at times I do get angry messages from players, but for the most part I receive support from people who see Arvo in a same way I do. He is a vulnerable teenager with a good heart who is in a far from an ideal situation. Are you familiar with the history of the creation of your character? Many believe that the prototype for Arvo is Harry Potter, and the internet is full of all sorts of speculation on this subject. How do you feel about your character (Arvo)? My goal, as an actor, is to justify the character’s actions. In Arvo's case, I didn't have to persuade myself too much. When the only thing that is left for you in this world is your sister, and she gets taken away, so does your hope in that everything is going to be okay. Having said that, Arvo aims for the shoulder when he fires a rifle. This tells me that not everything is completely hopeless, and there is still a chance of redemption for him. Few people know that in addition to Arvo you also voiced Vitali. In the game it’s very difficult to recognize it, it seems that the voices belong to different people. Was your voice changed by the studio? The further fate of Arvo remains to be behind the scenes. If he suddenly appears in the continuation of the story, will you be the one to voice him? Yes, at this moment the destiny of Arvo is unknown, but if he will get lucky enough to come back, I think it's safe to say, that I will be one of the choices that they will consider. One thing is absolute in this industry, is that there are no absolutes. Tell us about your current and future plans. Soon will premiere an Emmy and Golden Globe nominated TV show "The Newsroom", created by Aaron Sorkin and starring Jeff Daniels. To see yours truly, watch episode 5 on 7th of December. Most recently I starred in a promising short film "Death of a Government Clerk" story by Anton Chekhov. Adapted for screen and directed by Mykyta Samusiev. In the near future another great project is scheduling to be filmed in Minsk under the name of "Пес Рыжий" (Ginger Dog). At this time I cannot disclose more information, because I'd rather it be a surprise! 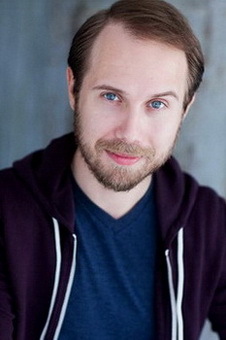 For those who are interested in following my progress, www.imdb.me/MichaelArk will tell you about my latest projects , and @ImMichaelArk on Twitter will let you know about projects in development. Thank you for taking the time to answer our questions. We wish you success and good luck. Happy to share with you, much obliged, and until next time! 1. "State Musical College of Gnesin" is the special secondary musical education institution in Moscow, is considered one of the best music schools in Russia (www.gnesin.ru). "The Moscow Conservatory of Tchaikovsky" is the higher musical education institution in Moscow (www.mosconsv.ru). 2. Cinema concern "Mosfilm" is the leading enterprise of Russian film industry (www.mosfilm.ru). 3. ADR - Automated Dialogue Replacement.